NO-RISK PURCHASE! UNCONDITIONAL 30-DAY MONEY-BACK GUARANTEE AND 5-YEAR WARRANTY. If you're unsatisfied with this item for any reason, we'll immediately refund your purchase price within 30 days, and free replacement within 5 years. 1.Check your car latch is sideways, otherwise it may not fit for your vehicle. Please check the car latch before placing the order. 2.Please make sure to apply the foam strip before you use the doorstep, it can prevent your car paint from scratch. 3.The area around the door latch is manufactured to withstand over 2500lbs in force to meet government accident safety regulations. This product is sold with a full 30-day money-back guarantee. If you're dissatisfied with your purchase for any reason, contact us for a replacement or refund. Go ahead to add the item to your shopping cart and check out, you will not be disappointed. I used mine to give me an extra boost when washing the top of my car. It's sturdy and non-slip. I like that it folds to make it compact. I have an SUV that I use to transport kayaks. I bring a mini step ladder so I can reach the top of my roof, but this little gem of a purchase works perfectly and since it's so much smaller than a step ladder, you can just leave it in your car. If you have a tall vehicle, this is a must have! I got this for my husband because he has a bike rack on the top of our Rav4. This is the perfect step for either attaching the rack itself or to step up and grab the bikes from it. It is VERY heavy duty and well made, no fear of it breaking or not being able to handle an adult's weight. I did try it on our pickup as well but the door latch where it is meant to hook in is a bit different and too thick for this to attach. 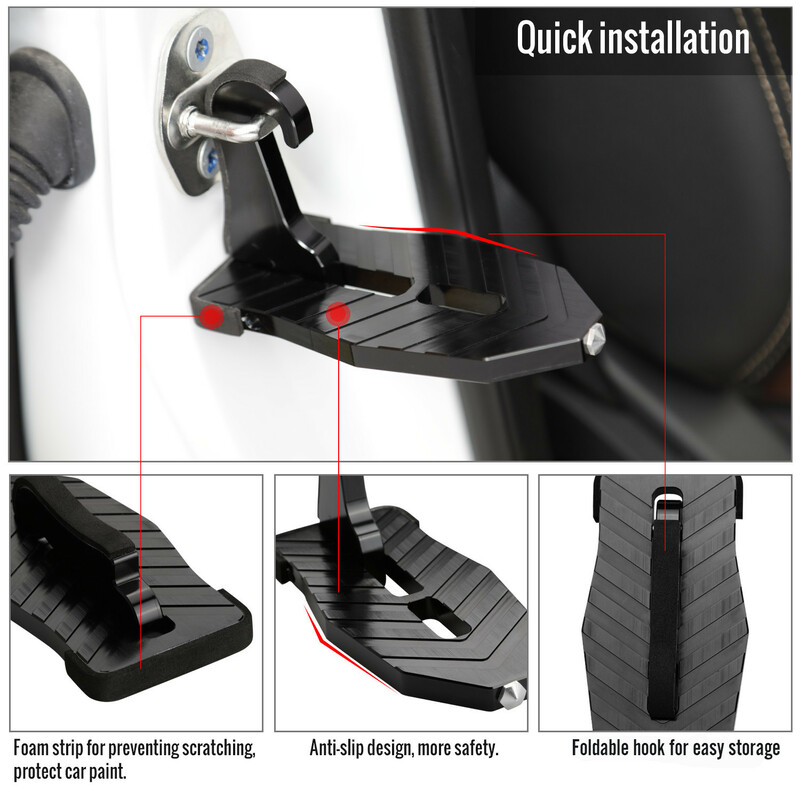 For us it's great because it works on the vehicle we intended to use it on, but just make sure your door latches are built like the ones in the sample pictures. I love this product for my truck which has a lift kit and is very hard for me to clean the top of it but knows I can clean the top of my truck with this product I love this especially when I go to the carwash. The perfect solution for reaching the roof of your truck. 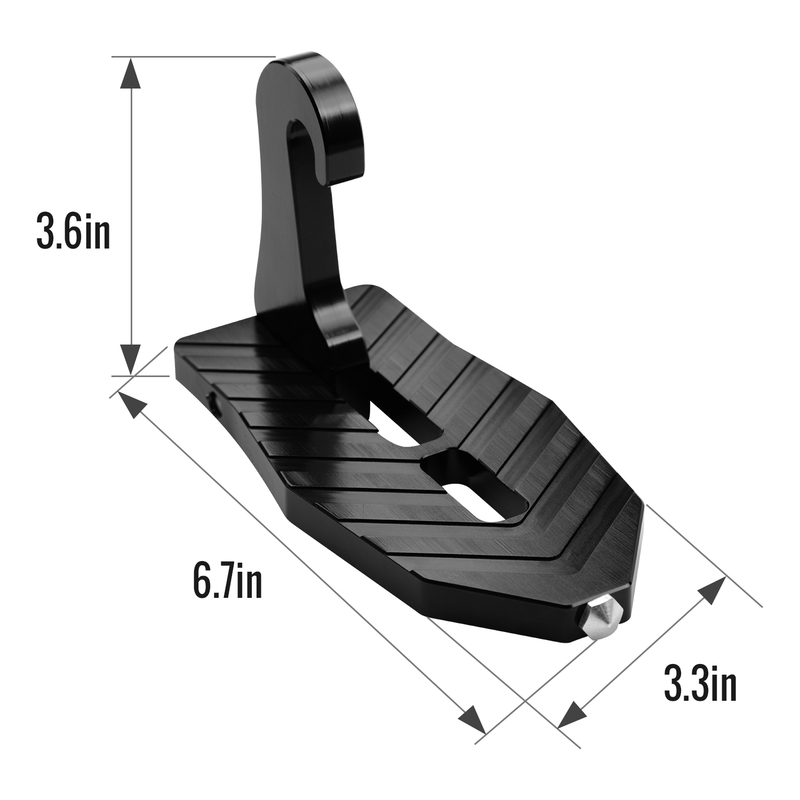 Securing your kayak, skis, or your roof mount cargo box. 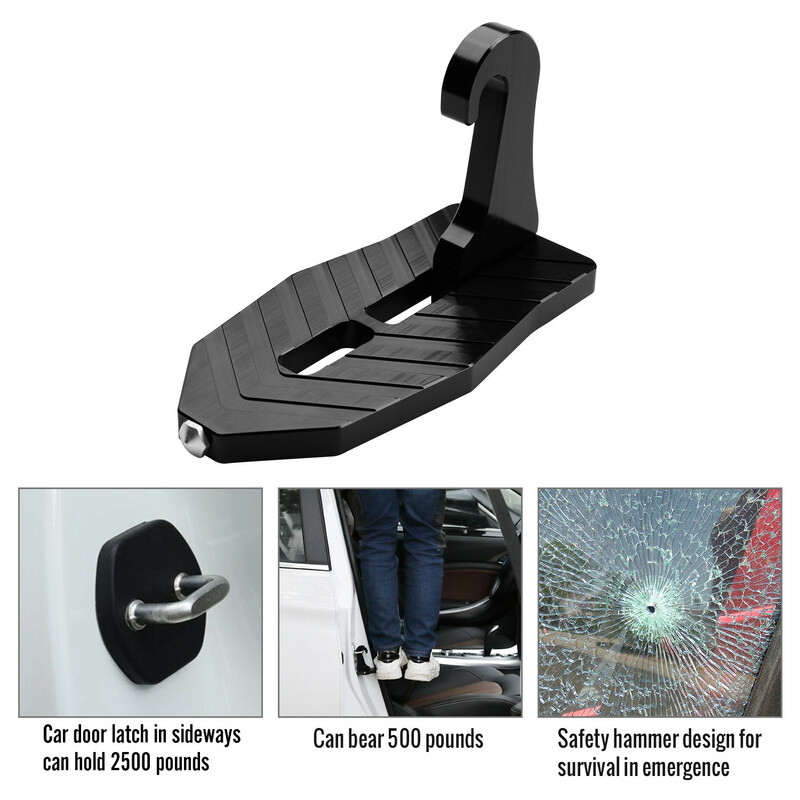 Just hook it on the door latch and you have a secure foothold that gives you access to the top of your truck or SUV. Also comes in useful when clearing snow off the top of your vehicle. Wish I had got one sooner. This material have a good weight to it and sturdy. Now I can finally wax all of the roof! I never new something like this existed. I detail my cars and the roof has always been the trouble spot, but not anymore. I feel secure on it and I'm not a small guy. I would be careful not to get it wet and then try to stand on it because it would be kinda of slick. I recommended it to all my friends who keep good care of their cars. Works great. I keep it in my side door. I have a F-350 I use it on. Helps me get access to the whole windshield. Just don't forget to remove it when you shut the door! I would def. recommend. Grippy enough but I would recommend you add a small piece of grip tape to the surface then you will have a solid stick! Solid build gear if you want to wash the car roof. I am moderate weight. It can hold an adult very steady. But do not forget to attach the rubber to avoid any dent to paint. I am a rather short person with a big family and I have been using the roof of my car to store additional things when we travel. Every time getting to the roof to secure the bags or whatever has been an issue until I got this. I am definitely going to use it from now on! This door step is strong and well built. The foam strips are not already on the device you have to put is on your self 3 are included only 2 are required. You will be able to reach anything on the roof u could ever need to access. The grooves do gave you enough grip to not slide off and it is big enough for the average foot size. I bought this item so I could have access to the roof of my truck while cleaning. It is perfect! 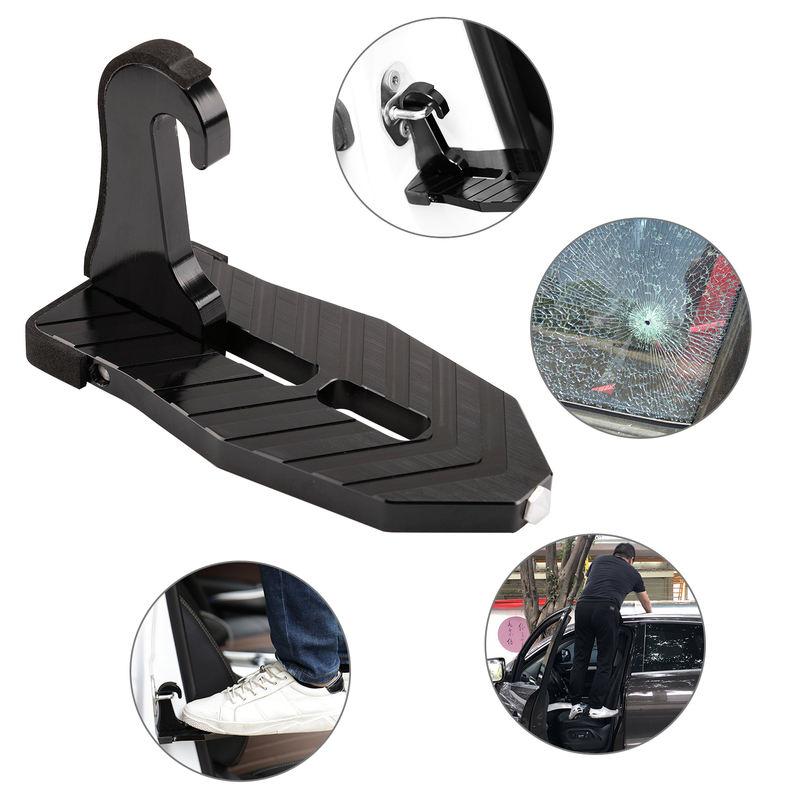 The stepper is sturdy and secure when placed in the door. The product will definitely last me a long time.